"In sports and business alike, the players are in it to win"
IT’S ABOUT THE GAME: Jack and Suzy examine business today from a number of different angles, giving the reader a holistic view from their experiences. IT’S ABOUT THE TEAM: This section explores how we can become better leaders in today’s marketplace and build the type of “WOW” team that is set up to succeed! IT’S ABOUT YOU: In this section the authors help us to get clear on the direction we want to pursue in our life and career. Jack and Suzy have done quite a bit of work in this space and give some great insights into how to overcome “career stalls” and position yourself to fulfill your individual potential! 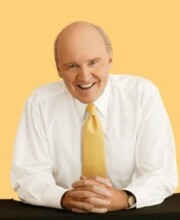 What Jack and Suzy Welch have written is an applicable, actionable blueprint for any business person to become a better contributor, teammate and leader in today’s new business environment. "Think of Yourself as the Chief Meaning Officer"
When you really step back and think about it, most people spend 40 hours a week for 40 years of their lives working. That thought right there is mind blowing in and of itself. If, as a leader, you aren’t helping your employees make meaning of that investment, you’re wasting their time and lives. This is the foundation on much of the leadership dialogue that takes place in the book. The discussion is always bringing it back to what’s the purpose of your organization, your team, and your people. "People may not always want to hear the truth, but they tend to trust the people who deal in it, demand it and display it at all times"
Genuinely listening to others will help you to build a more trusting relationships when done consistently and sincerely. "You do have a hiring checklist, right?" Having leadership responsibilities usually means that you have some input and say in the hiring decisions that are made for your team and organization. As Jack and Suzy say countless times throughout the book, “Great teams start with great players”. That’s why hiring the right talent is so critical to your success as a leader. Make sure the list includes IQ. In today’s business environment, the playing field isn’t level. It’s titled toward the team with the smartest people. Personality matters. Even a bad one. Negative energy can infect your team and your organization. In short, whatever your process is, make sure you have one and that you constantly refine it over time. Jack and Suzy Welch have created a complete, practical business book that covers topics that are vital to winning in business, becoming a more effective leader and finding out what your true purpose and passions are in your career. Whether you read the book cover to cover or use it as a just-in-time reference guide to addressing challenges and hurdles that you’re facing, The Real-Life MBA is a great one to have on your bookshelf. I love the last line in the book, “Because work is great. It’s life. It’s what we do.” Reminding ourselves of this really pushes us to evaluate if what we’re doing is really what we’re “meant” to do. Is your career giving you the purpose and impact that you want?